For 25 years, Rick Masumbuko, has dedicated his life to Nyungwe forest. Now 59, Masumbuko has no regrets for the path taken years before the forest was elevated to national park status. He fell in love with the park when he was still a teenager after joining a team of Rwandans and Swiss conservationists who were working to plant trees around the forest-in what is better known as buffer zone. He later worked as an aide to the team in their research on bird watching, trees, primates and different types of plants in Nyungwe forest. Then in 1987, the father of six started his long-desired work as a tour guide in the park. And he has never looked back, turning down a number of ‘highly paying’ jobs to keep this one. Today, despite his advanced age, Masumbuko still leads tourists around Nyungwe Park, but this time showcasing Rwanda’s rich culture through Community Tourism. “It is very, very important to exchange with others. We get many visitors from outside and obviously we learn from them,” Masumbuko, who fluently speaks several languages including English, French and Swahili- says. 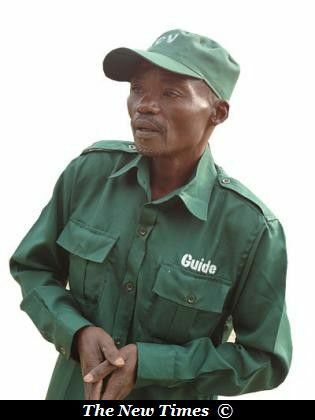 The man who never studied beyond primary school spends everyday guiding tourists through local communities and explaining to them about Rwandan culture. He takes tourists through tea, banana and coffee plantations as well as helping them through mountain trails to witness the lifestyle of local residents and visit handicraft workshops, among others. “The benefits of community tourism are immense. Visitors go to the villages and learn the Rwandan culture from the very people living and practicing it,” Masumbuko says.